Gunk Haus is like a 1000 piece jig saw puzzle, you put the right piece into its spot and it makes its surroundings more complete. That's how I feel anyway. 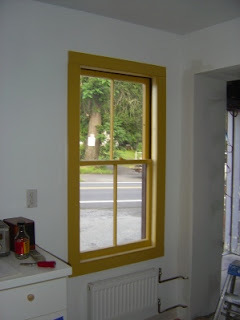 Today's piece was the window in the dish station, replace the sashes, scrape off old paint, repaint, add window trim, you know what I'm talking about. E! was working on the door for between the wait station and the beer hall. Soon this piece of the puzzle will be put in its place as well. We had Joe, our security meister, here today. He had already wired the first floor and basement for smoke detectors, pull stations and such, but we needed to add a smoke / carbon monoxide detector on the second and third floors as well, because we live there and because it's not a bad thing.